Men Without Women (translated by Philip Gabriel and Ted Goossen, published by Harvill Secker) is a collection of seven longish stories involving male protagonists, connected by a lack of success in their love lives. The reasons for the men’s issues differ, with some having lost a partner and others never having known one, but each of the pieces has at its core the question of how to move on without someone by your side. The collection doesn’t seem to have received the usual fanfare accompanying a Murakami book, partly perhaps as his novels overshadow his shorter fiction (even though he does both very well). In addition, some of the stories will sound rather familiar, with five having already appeared in English (four in The New Yorker alone). She was wearing a man’s herringbone jacket that was a bit too heavy for May, brown cotton pants, and a pair of black Converse sneakers. Beneath the white long-sleeved T-shirt under her jacket Kafuku could see her larger-than-average breasts. It’s not exactly Two-And-A-Half Men, but if you’re looking for well-rounded female characters, this may not be the book for you. Yet if Murakami’s weaknesses are quickly on display, so too are his strengths. In the opening story, ‘Drive My Car’, once the initial encounter between an actor with a driving ban and the woman he chooses to ferry him around is out of the way, the usual compelling style emerges, gradually introducing a story of the man’s past into the conversation taking place during a night-time drive. The female driver turns out to be merely a sounding board for the actor’s memories, as he reminisces about his dead wife and the last of her many extra-marital affairs, the outside world simply melting away as the driver (and reader) listen to him talk. There are many similarities (in terms of style, and strengths and weaknesses) in ‘Scheherazade’, in which a man confined to a house is regularly visited by a married woman who takes care of his culinary and sexual needs. Once again, the apparent main story is merely a frame for the woman’s confession of a period in her youth when she became obsessed with a boy in her class, going to extreme lengths to get closer to her crush. On the other hand, ‘Yesterday’ has an unusual character (a Tokyo native who has become fluent in the Kansai dialect) unable to move on with his life, leaving his beautiful girlfriend frustrated at his inability to take their relationship to the next level. It’s a story with more than a few nods towards Norwegian Wood, and the coda again has Murakami’s familiar nostalgia-steeped fingerprints all over it. ‘Yesterday’ isn’t the only story with echoes of past work. ‘Kino’, in which a man recovers from finding his wife in flagrante with another man by opening a small bar, is Murakami by numbers (yes, there’s a cat…). When a mysterious stranger urges him to go on a journey to escape certain dark elements surrounding his new home, it all turns a little Kafka on the Shore, and every time I read it, I get the feeling that there’s a novel in there waiting to get out (lest we forget, both Norwegian Wood and The Wind-Up Bird Chronicle started out as shorter pieces). ‘Kino’ starts off intriguingly enough, but it fizzles out a little and doesn’t feel as complete in itself as some of the other stories do. Another I wasn’t overly taken with was ‘Samsa in Love’, a rehash of Kafka’s The Metamorphosis. Murakami has a creature wake up as a human called Gregor Samsa, and what ensues is a lesson in how to manoeuvre the rather fragile and ugly human body around a house, as well as an encounter with the aforementioned hunchback. To be honest, this is little more than a creative writing exercise in Kafka fan-fiction, and having been guilty of that myself on several occasions, I can’t say I was impressed. It’s quite easy to become Men Without Women. You love a woman deeply, and then she goes off somewhere. That’s all it takes. Most of the time (as I’m sure you’re well aware), it’s crafty sailors who take them away. They sweet-talk them into going with them, then carry them off to Marseilles or the Ivory Coast. And there’s hardly anything we can do about it. I used to really like Murakami but fell out of the habit (not from disaffection, just chance really). While I do expect to go back to him I think it won’t be with this collection. A shame about the sexism, I hadn’t noticed it back when I was a fan but perhaps there was less of it given it was the earlier works, or more likely perhaps I was just less alert to that sort of thing than I tend to be now. 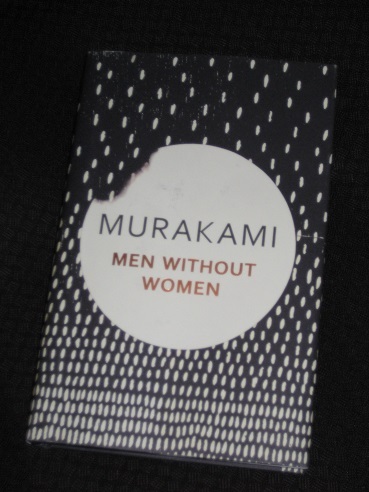 I think the casual sexism would be a little too much for me – I too lost interest in Murakami a while back and I doubt this would persuade me back! I’ve become less excited by new Murakami books over the years – where he was once fresh and new he now seems rather repetitive. This is partly because my own reading now has much wider horizons, but also because he seems comfortable not to challenge himself in his writing anymore. Grant – I think it may also be because he’s peaked as a writer (and fair enough too as he is around retirement age!). I’ve just finished rereading ‘Kafka on the Shore’, and while there are some very disturbing passages (again regarding interaction between the sexes, shall we say…), it was an absolute pleasure to read. Having said that, I did enjoy ‘Colorless Tsukuru Tazaki…’, and I’ll be very keen to read the new novel when it finally appears in English. Like other readers have mentioned, I was obsessed with Murakami and read a stack of his books years ago, then stopped…. but I did read Colorless Tsukuru Tazaki and enjoyed it a lot, and just started this, and love it so far! The first two stories are wonderful. I wish he’d write more short stories. Jeff – I actually reread ‘Colorless Tsukuru Tazaki…’ recently, and I think it’s an excellent book. His short stories are great, and ‘The Elephant Vanishes’ is a much underrated work.